bit.ly is very popular URL shortening service. Taking inspiration of sorts, here is Vidly that serves another feature for using Twitter. It allows you to upload and share videos with Twitter friends. Besides the usual quality videos, it also supports high definition and high resolution video uploading and sharing. To get started, you can upload video from the computer or quickly record using webcam. You can transfer video from mobile using official iphone app. Making this more easy, you can also import and share any online video from YouTube, Blip.tv, TwitVid. Just enter the video URL and you are all set. Besides uploading and sharing videos, there is lot of video content available for viewing uploaded by other users. Homepage show trending videos, new videos and HD videos being shared by users. 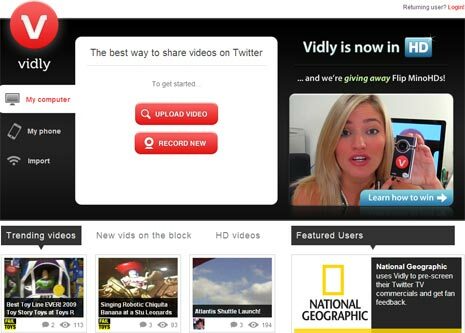 Checkout Vidly, overall handy service to push and share videos with Twitter friends. It has active and buzzing community of users playing around with videos.